It looks like the transition from TransLink to Clipper is on-track. Here's a few things I've noticed. 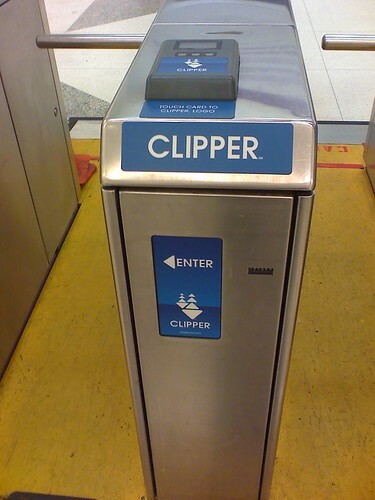 As seen in the photo above, Muni metro gates have the new blue color clipper branding. At this point, Muni has not installed the new fare gates that will replace the over two decade old ones that are still being used today. On Muni vehicles, such as the metro, the vehicle card readers have been re-branded. The new logo has a sticker covering the old "T" logo used by TransLink, and the word Clipper has been placed over the TransLink name. The contractor doing the work has also removed the old yellow stickers telling people how to use the card and the old sticker residue. BART is transitioning to Clipper, but you may still notice the fare gates still have the TransLink branding. I have noticed the quicker response of the TL cards on the gates on my most recent trip last night on BART to and from the Giants game. If you use Commuter Check paper vouchers, you can claim them at Walgreens locations who agreed to do TransLink/Clipper transactions. The add value terminals they use have been upgraded so they don't have to feed the card into the slot, they place it on a sensor pad about the size of a brick. In many cases, you can do the TL/Clipper add value transaction at their photo center. While the re-branding is supposed to be finished by June 16th, the official day Clipper replaces TransLink, not everything has been completed. I've noticed some of the downtown SF automated add value machines have not been upgraded with the new logo and the slot feeding reader being upgraded for non-gold chipped cards. Lastly, there's no official word on the opening of their in-person customer service center at Embarcadero Muni/BART, but funding has been designated by the MTC to open such a center.